TGIF!!! Over the Easter long weekend, I've done some shopping. I know it's not sale season, but I managed to find some great deals here and there! My boyfriend and I hit up Toronto Eaton Centre because I have decided to purchase a MacBook Pro! I have debated, contemplated, and lusted for so many months, and I finally jumped the gun! Partly because I finally can't stand being computer-less. Can you believe I haven't had my own computer for a year? I was beyond excited. I was going to go straight to the Apple Store, but hey, we were at the mall, might as well shop around! First place that I made a purchase: Forever 21. I haven't really bought anything from there since December 2012. And the reason I went that time was just that I really needed a black blazer. This time, I was able to find two things through the madness (Forever 21 is like a maze sometimes). 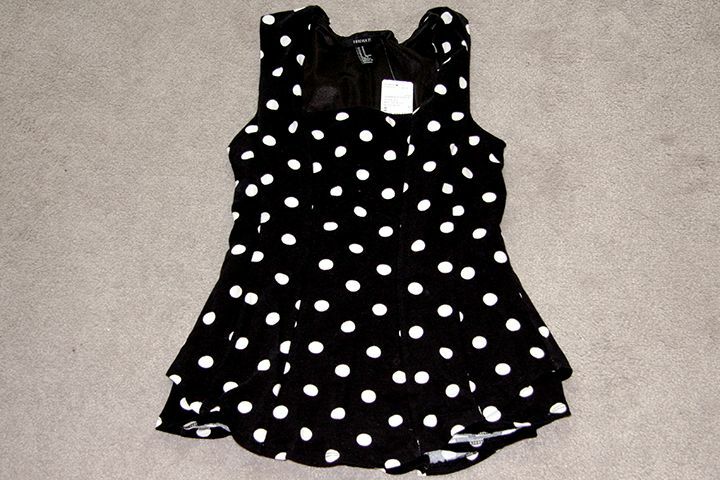 I really wanted a peplum top, and I found this black with white polka dot. It reminds me of 1980's pin up look :). I tried on the small size at first but the medium size has a longer cut, but now looking at it, I might need to go back and exchange for the small... We'll see.. I also got this cute bow necklace that only costs me $1.80... That's $2.03 after tax... I can't say no to that :P.
Well, I didn't really buy THAT much. 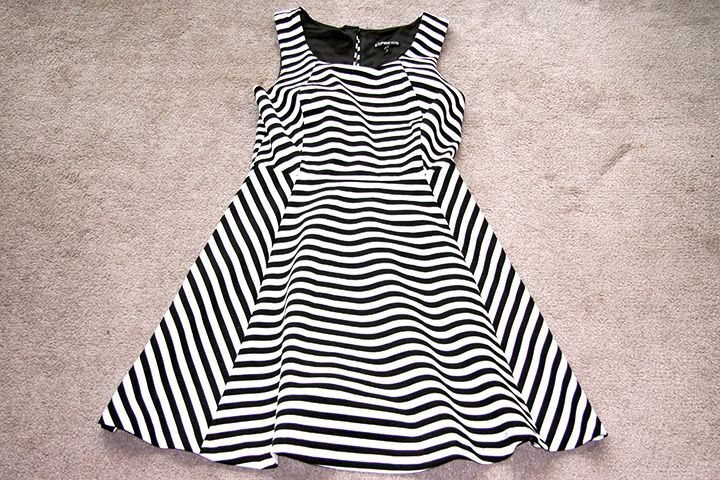 I got a striped dress. 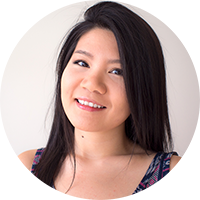 Usually I avoid excessive stripes, because they make me look wide and it's not that desirable. However, this dress, because of the direction of the stripes, it creates an illusion that I am skinnier than I actually am. It's quite flattering, even the boy said so. The boy's haul, well, is larger than mine (in Express anyway). He got a suit and some cardigans. Not bad, not bad... It makes me feel less guitly though, haha. Our final stop of the day : Apple Store. And I walked out with my new love - 15" MacBook Pro with Retina Display. Enough said. We decided to finally hit up a Canadian Target! I was quite excited because I really like going to American ones. I have heard not-so-good things about the pricing and such at the Canadian stores. But it's Canada, I'm not complaining much. As far as I can see, for stuff that is also available in Walmart, the prices are about the same (Target might be a touch more expensive). Anyway, I originally had more than a few things in hand but I was not able to try them on because the store was closing :/. So I got two things that did not require me to go to a fitting room. 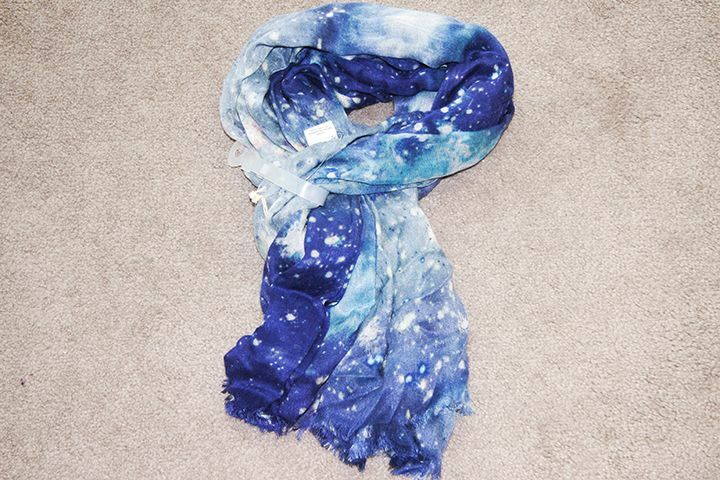 This galaxy printed scarf caught my eye and I didn't want to let go of it because it's so pretty. I was on the market for a scarf for Spring, so I found this at a good timing! 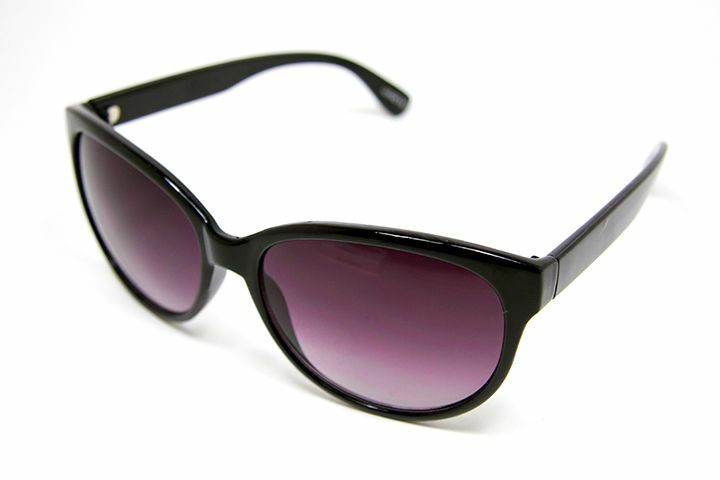 I also got a pair of almost-cat-eye sunglasses... Now I don't know what compelled me to buy it but I just took it to check out with me. I guess a girl can never have too many pairs of sunglasses, right? Especially for a girl who loses things VERY easily... clumsy, I know! I was not satisfied by the brief visit we had at Target, so we went to Walmart next. Walmart Supercenter is great because I also got some grocery done XD. But knowing me, I headed straight to the cosmetics aisle 'cause that's just what beauty addicts do. I spotted tons of sales on Maybelline and L'Oreal. 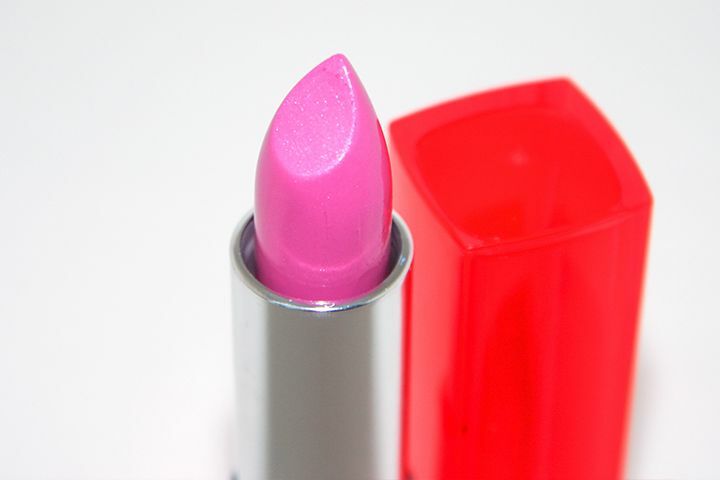 But I only got myself a Maybelline ColorSensational Vivid Lipstick in Pink Pop. I would have gotten more if this is not the only one that has not been opened. The fact that it's not tightly wrapped or there are no security tape of any sort makes me nervous. But this lipstick did not seem touched. Still, I'm gonna sanitize it just in case. I was also looking at the Revlon display to see if any of the new shades in Lip Butter is out in Canada yet. I didn't find any, of course, but I did find a combo pack of Revlon Nearly Naked Foundation and Pressed Powder. I was running like a mad woman to find the price check machine... Okay, maybe I was exaggerating, I just walked to the next aisle to check the price. It was $10.96 for the combo, for both the foundation AND the powder! I have wanted to try the Revlon Nearly Naked line for some time now after all the hypes in the beauty community, and this is the perfect opportunity! Our next and final stop: Marshalls. I was surprised that it was still open at 7pm, and since we were already there, why not? I wasn't able to find any clothing item that I like with a good price. 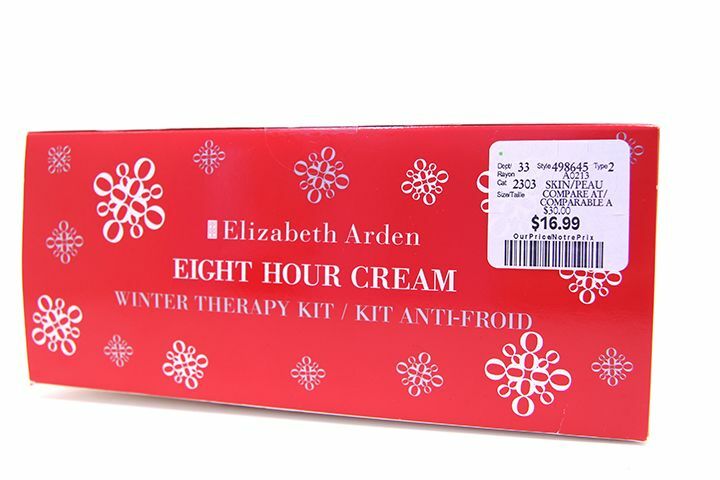 But I did find this Elizabeth Arden 8 Hour Cream gift set. I have heard other bloggers talked about finding this set at Marshalls or Winners, but I have never seen one until today. 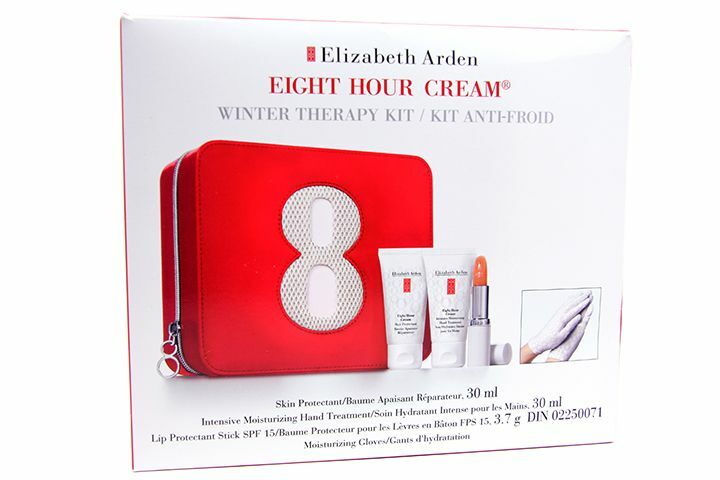 This is a pretty good starter set to try our the Eight Hour Cream line. Since my hands are incredibly dry these days, I decided to try this set out. So this concludes my shopping adventure this past weekend. I have to say it was quite successful! I got what I needed/wanted and found some good deals along the way. I hope you guys are having a great week so far! The striped dress is so cute! I love that necklace! 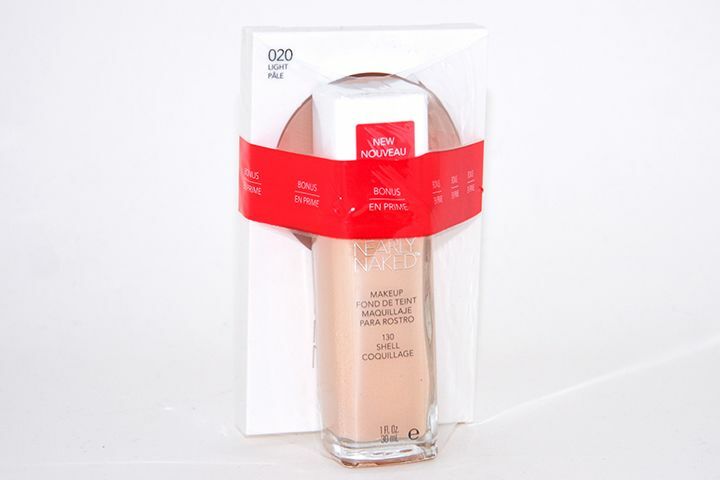 & my favorite foundation too! !